Edvard Munch (1863–1944), Vampire (1893), oil on canvas, 77 × 98 cm, Munchmuseet, Oslo. Wikimedia Commons. Edvard Munch seems to have started thinking about assembling his paintings into series during the 1880s, but it was not until the early 1890s that he crystallised this in his personal notebooks. He talked about building them into a ‘symphony’ in early 1893, and by the end of that year exhibited his first self-contained series of images in Berlin, under the title A Human Life. During 1893 and 1894, Munch painted most of the works which were to form his first Frieze of Life, which was exhibited in March 1895, in Ugo Barroccio’s gallery in Berlin. This article shows the closest approximation that I can get to that original series, using available images. Munch’s own explanation is that “the paintings are moods, impressions of the life of the soul, and together they represent one aspect of the battle, between man and woman, that is called love” (Heller, in Wood, 1992). Most of the paintings were included in his later and larger version of the Frieze, and I will consider them in more detail when I cover that series, in the next articles in this series. Those which only appear in this first version of the Frieze I examine more thoroughly below. 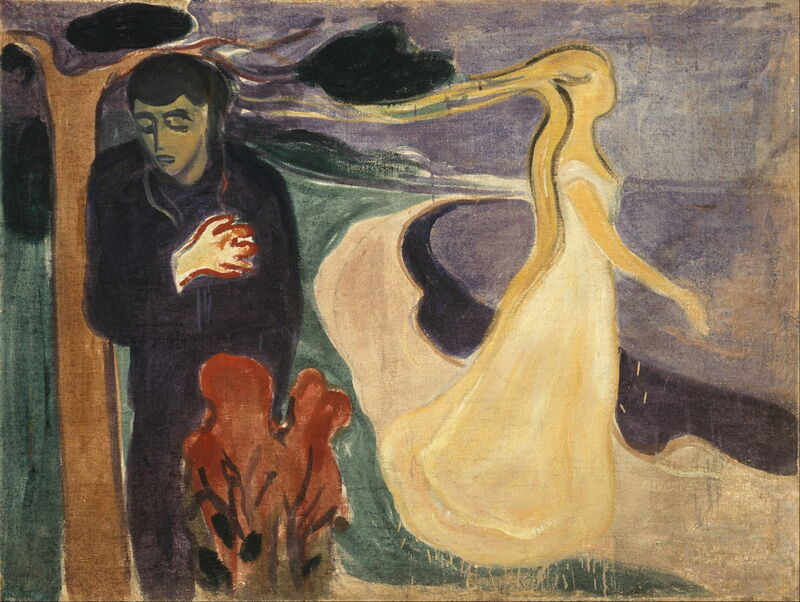 The series opens with paintings in which love is almost rejected, according to Munch. Edvard Munch (1863–1944), Starry Night (1893), oil on canvas, 135.6 x 140 cm, J. Paul Getty Museum, Los Angeles, CA. Courtesy of the J. Paul Getty Museum, via Wikimedia Commons. Starry Night (1893), which was originally known as Mysticism, opens Munch’s narrative by setting the scene. It is unique in being the only work in this series in which human figures are apparently absent, although on closer examination there are the backs of two heads at the left lower edge. In subsequent lithographs developed from this painting, the figures became more prominent, e.g. in Attraction I (1896). The view shown is believed to have been that from the window of the Grand Hotel in Åsgårdstrand, on the west side of Oslo Fjord, where Munch started his love affair with ‘Mrs Heiberg’ (actually Millie Thaulow, a cousin by marriage) in about 1885. This shows the neighbouring garden, its white fence running diagonally into the centre, and providing vital clues on depth and perspective. The large dome is formed from linden (lime) trees, and the lowest star in the distance is Venus. 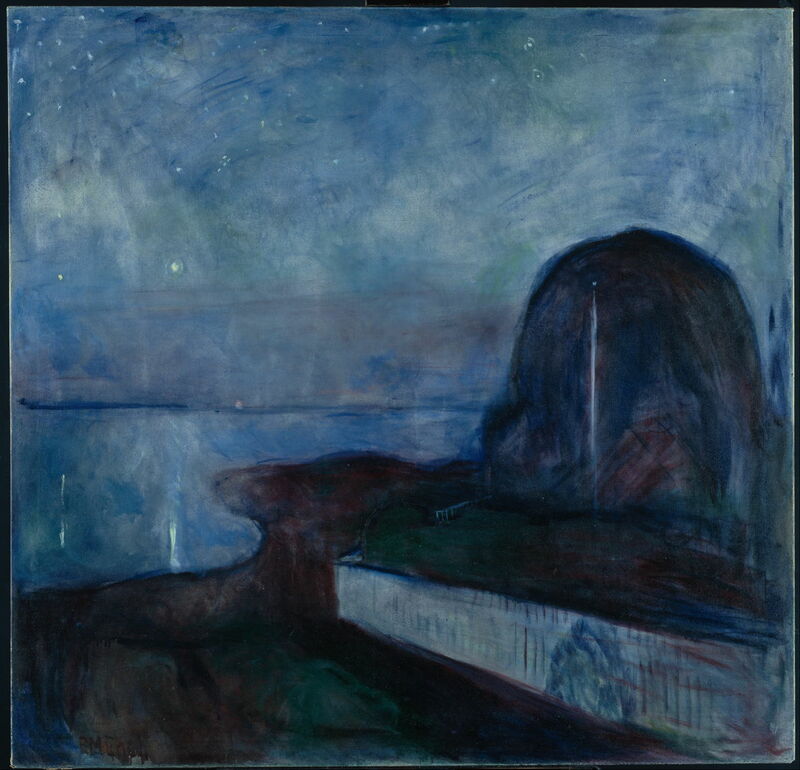 Munch has written comparisons between the human soul and planets, and he saw the transience of love being reflected in the phasic appearances of the planets in the sky. Edvard Munch (1863–1944), Eye in Eye (1894), oil on canvas, 136 x 110 cm, Munchmuseet, Oslo. Source of image unknown. The relationship between the couple develops, and is made more visible, in Eye in Eye (1894), which was originally known as Two People. In its early form, this works seems to have been more gloomy in its colours and tones. 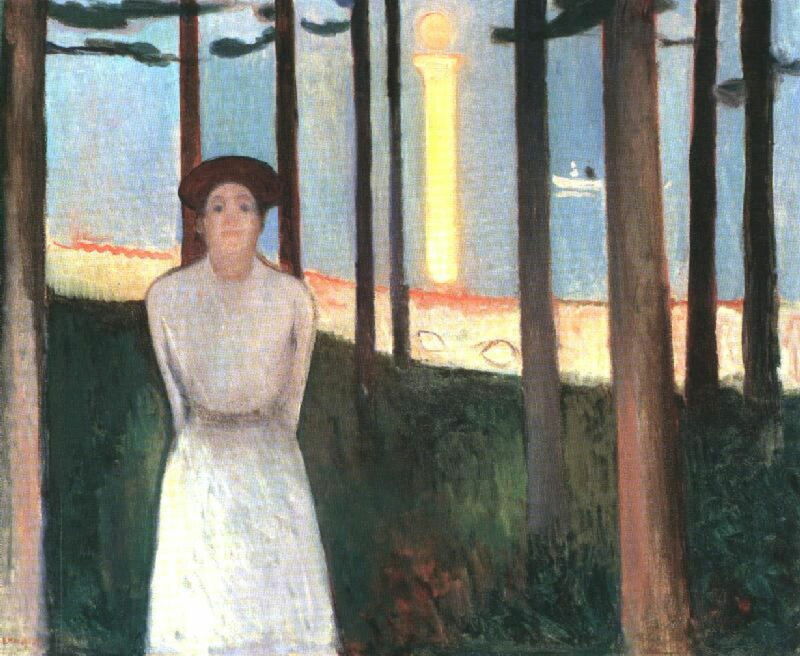 It is thought that after 1906, Munch overpainted the hair of the woman and the tree to add the bright highlights which are now visible. Third in the series is the Boston version of Summer Night’s Dream (The Voice) (1893), which was originally known as Two Eyes. A woman, almost certainly Munch’s lover ‘Mrs Heiberg’, is shown at the edge of the Borre Woods, to the north of Åsgårdstrand. The reflection of the moon on the flat surface of Oslo Fjord appears like a column of light. A second version of this painting, in Oslo, is cropped more closely and has additional boats on the fjord. Edvard Munch (1863–1944), The Kiss (1897), oil on canvas, 99 x 81 cm, Munchmuseet, Oslo. Wikimedia Commons. 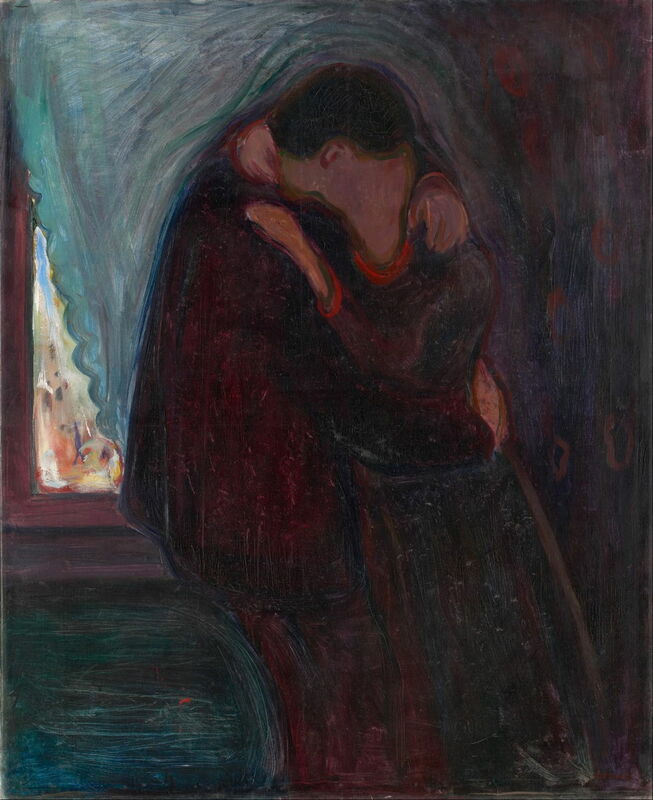 The Kiss (1897) is a later version of the painting shown in Berlin, and it isn’t clear whether Munch included one with the close-cropped couple kissing, as shown here, or the first version from 1892 (shown in the previous biography) which includes a street scene to the left of the lovers. Later versions followed this cropped form, in which the lovers dominate the canvas and fuse into a single form. Munch’s love affair soon starts to develop more worrying tones. Although the couple in Vampire (1893) are embracing, her kiss is now starting to form part of what he saw as the battle between them, the woman in the role of femme fatale. 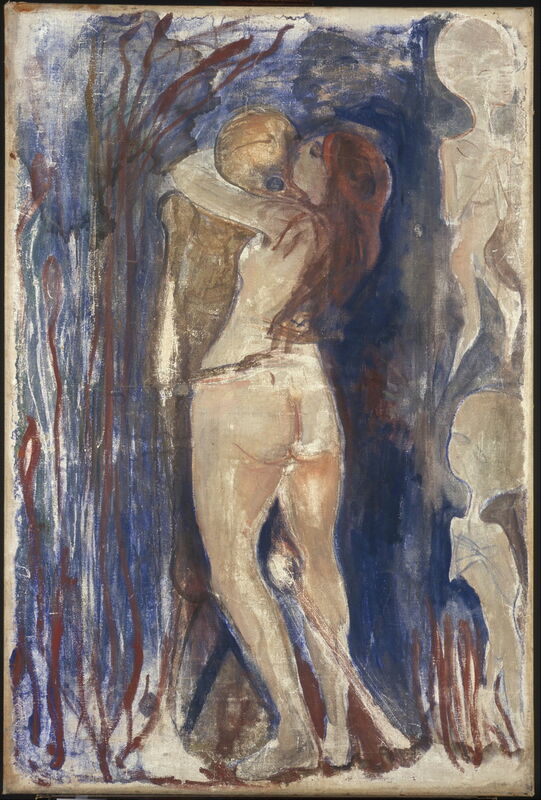 This was a popular theme in arts and literary circles in Berlin at the time, for example in works about Moreau and Wilde’s revision of Salome, and it was only later that Munch gave the painting the lame euphemistic title of A Woman Kissing the Back of a Man’s Neck. Edvard Munch (1863–1944), Death and Life (Death and the Maiden) (1893-94), oil on canvas, 128 x 86 cm, Munchmuseet, Oslo. Wikimedia Commons. Death and Life (Death and the Maiden) (1893-94), which had originally been known as The Loving Woman, progresses this souring of love, as a naked and wanton woman kisses a skeleton of a man. Framing them in repoussoir are long-tailed sperm cells, at the left, and two foetuses, at the right. This is one of Munch’s most complex images, and invokes the cycle of life, from gametes through intra-uterine development, to love, then death. The artist intimately links Eros, procreation, and Thanatos (death) in a strongly Symbolist way. It thus is the herald of later paintings in his second version of the Frieze which consider death. 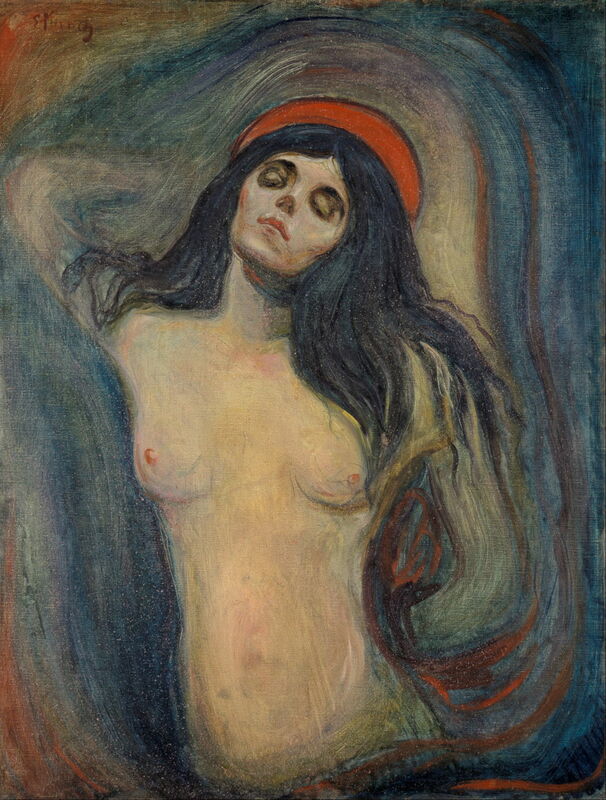 Munch’s Madonna (1894) is another Symbolist combination of conflicting themes, of the saint, whore, and abandoned lover. This is shown in her halo alone: a mark of the saintly, he uses the colour associated with earthy eroticism. In more conventional Christian religious art, these themes were normally reserved for Mary Magdalene, and Munch’s invocation of them for the Madonna must have been shocking at the time. Woman in Three Stages (1894) was originally known as Sphinx, and was first exhibited with a quotation from a play in which a woman appears as three different personalities to her three lovers. 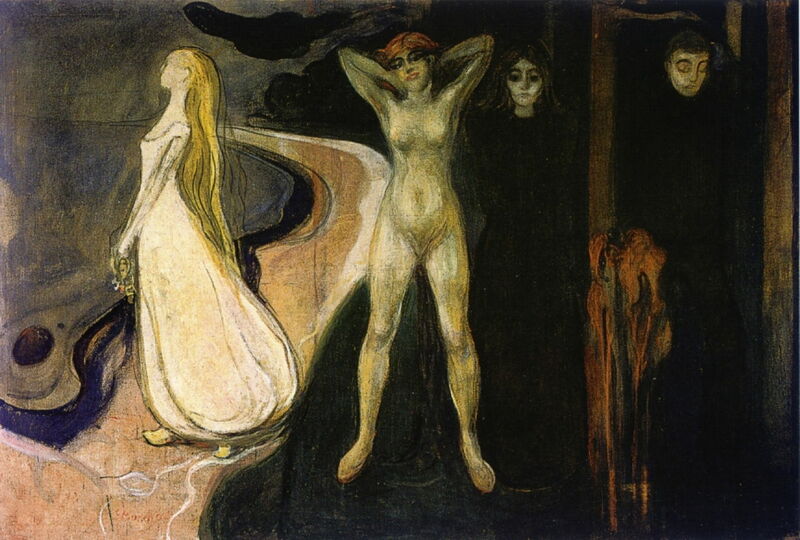 Here Munch shows three women: a young romantic on one of his undulating bays, a naked femme fatale, and a darkly-dressed matron. At the right, a man stands, his face cast down in dejection. It is a series within the outer series, a frieze on its own. Edvard Munch (1863–1944), Separation (1896), oil on canvas, 96 x 127 cm, Munchmuseet, Oslo. Wikimedia Commons. Separation (1896) follows directly from, and echoes in its composition, Woman in Three Stages. Using thin applications of paint briskly applied to unprimed canvas, Munch takes the young romantic woman to walk out towards the fjord, her hair streaming as she goes. 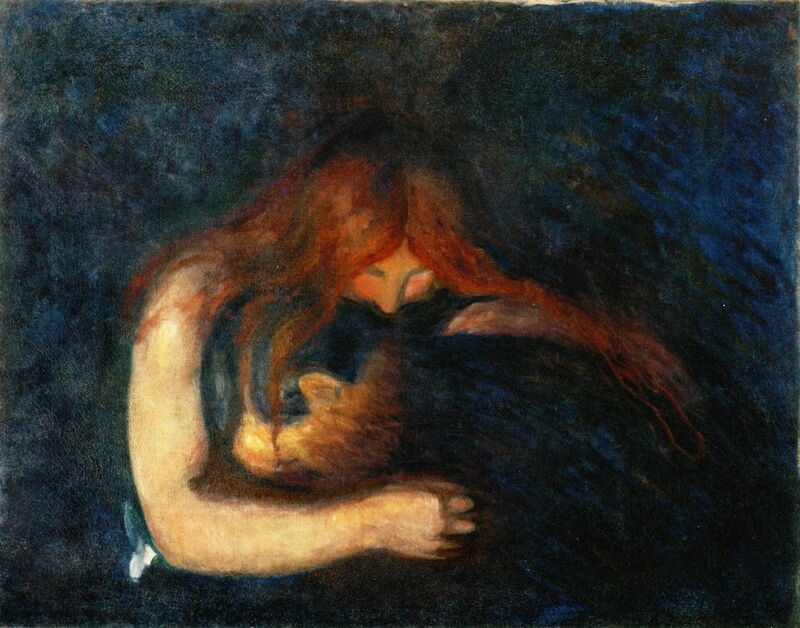 Munch suggested that her hair is wrapped around her lover’s heart. The dejected man is now rejected and separated, clutching his heart. 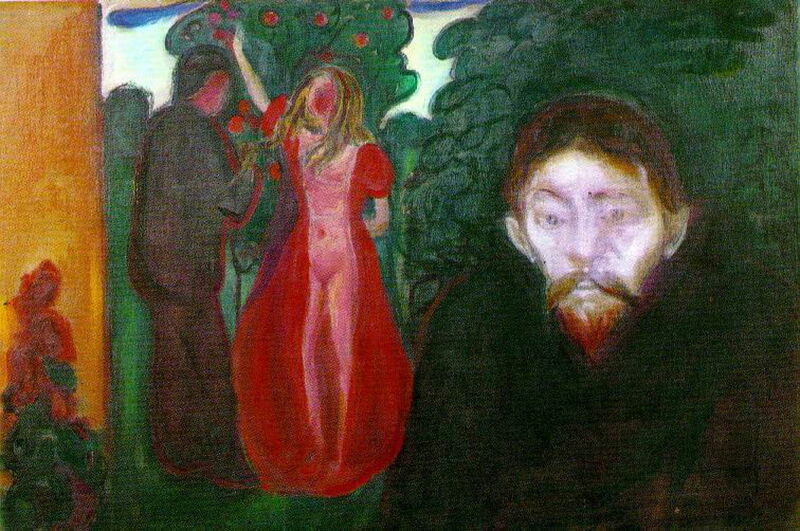 Munch developed this painting into two lithographs, Separation I and II (both 1896), in which he zoomed in more closely on the heads and shoulders of the two figures and added detail to the formless face of the woman. Edvard Munch (1863–1944), Hands (1893), oil on canvas, 91 × 77 cm, Munchmuseet, Oslo. Wikimedia Commons. Hands (1893) uses the same near-naked woman featured in Woman in Three Stages, a drypoint The Woman (1895), and clothed in Ashes (1894). Her hands are clasped behind her head, but the hands of others reach out from around the edge of the canvas, in lust for her body. Edvard Munch (1863–1944), Jealousy (1895), oil on canvas, 67 × 100.5 cm, Bergen kunstmuseum, Bergen, Norway. Wikimedia Commons. This progresses to Jealousy (1895): in the background, Eve, her dress open to reveal her body, is reaching up to pick an apple for Adam. The satanic face at the right looks directly at the viewer, his jealousy made clear. 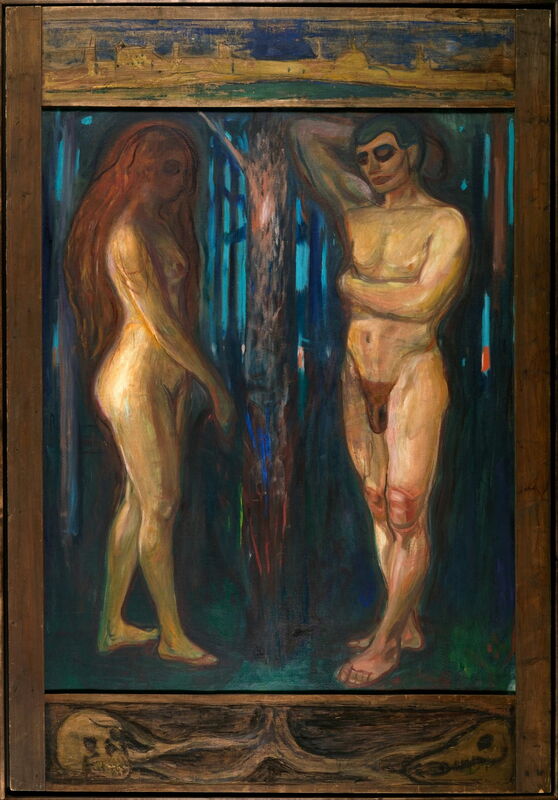 Beyond the Frieze, this painting was part of an artistic dialogue between Stanislaw Przbyszewski, model for the face at the right, and Munch, who was having an affair with Przbyszewski’s Norwegian wife at the time. The writer Przbyszewski responded by having a jealous painter commit suicide, in his novel Overboard (1896). 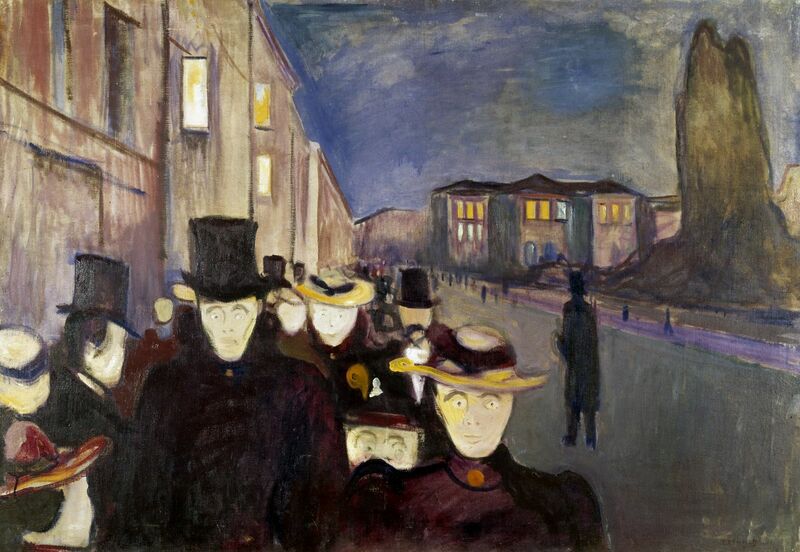 Evening on Karl Johan (1892) was originally just known as Evening, and grows the anxiety. Set on the main street in Norway’s capital city, it looks from the Royal Palace towards Storting (the parliament building) with greatly foreshortened perspective to pack the pedestrians together and instill a deep sense of anxiety. This refers to an episode during Munch’s affair with ‘Mrs Heiberg’, in which he was anxiously waiting for her. Edvard Munch (1863–1944), Anxiety (1894), oil on canvas, 94 x 74 cm, Munchmuseet, Oslo. Wikimedia Commons. 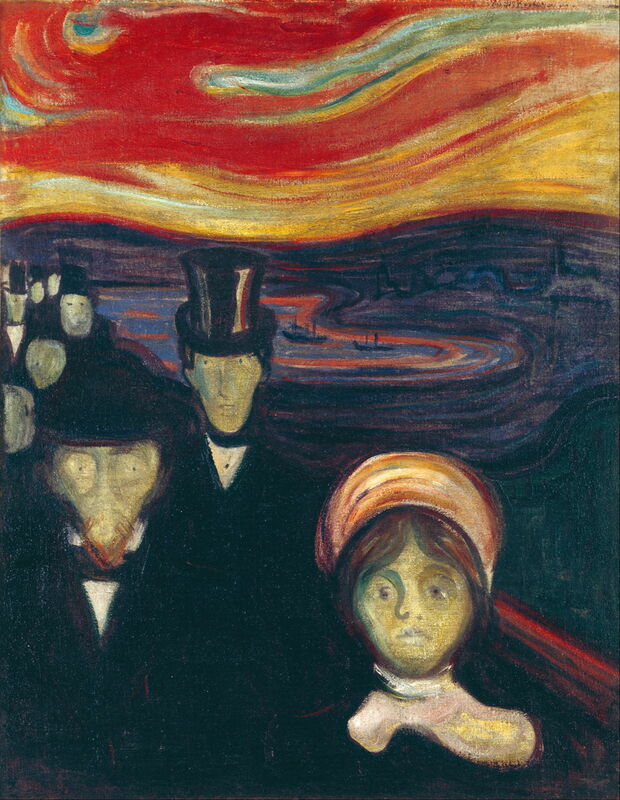 Anxiety (1894), which was originally known as Insane Mood, is an intermediate composed of the stream of people in Evening on Karl Johan transposed into the setting of The Scream, and acts a the transition between them. 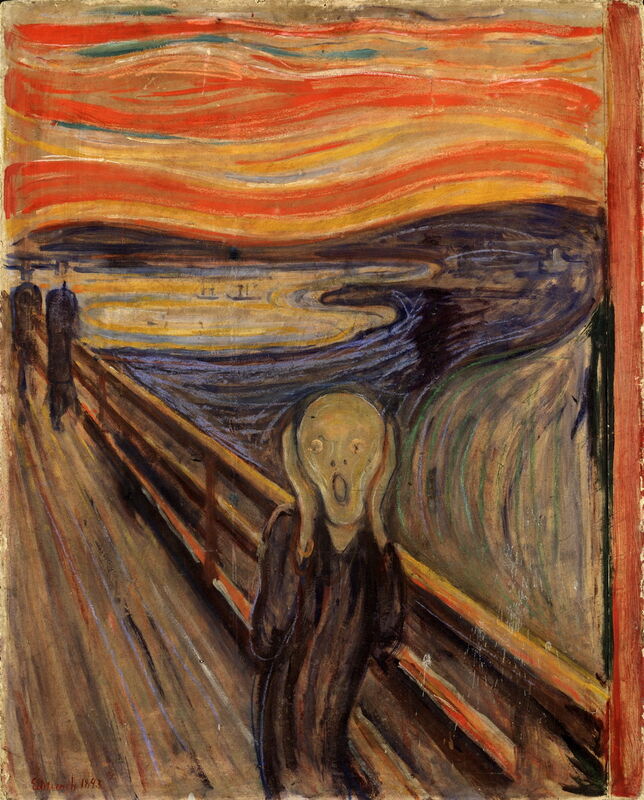 I have already described The Scream (1893) in detail. In this first version of the Frieze, it forms the culmination of the collapsed love affair, in which a great scream passes through the whole of nature. Edvard Munch (1863–1944), Metabolism (1898–99), oil on canvas, 172 x 142 cm, Munchmuseet, Oslo. Wikimedia Commons. This first Frieze ended with a vignette of Metabolism (1898–99). 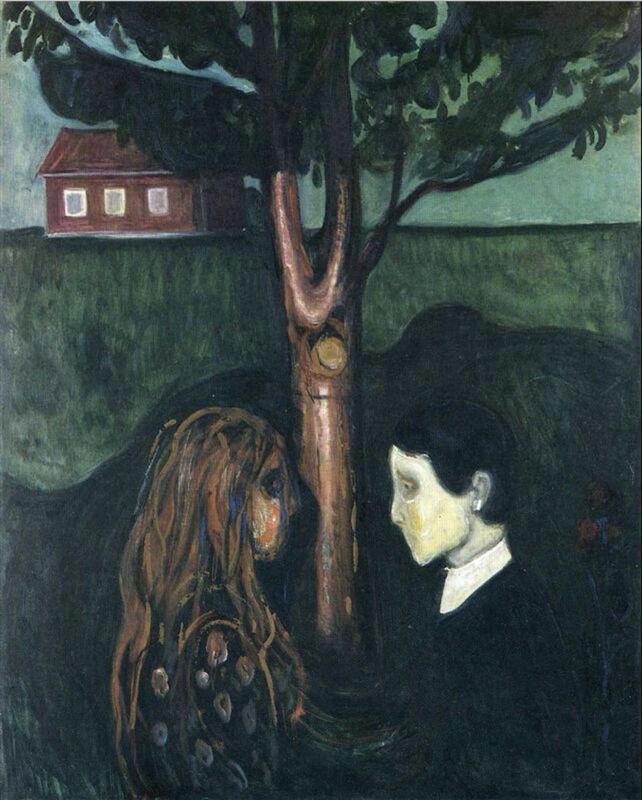 Munch considered this necessary to the whole “as a buckle is to a belt.” A young man and woman meet in a dark wood. Just peeping through some small gaps in the treetrunks are glimpses of the ‘golden city’. In the version of this painting shown at the time, there was an exuberant plant in the foreground between the two figures, in which there was a human foetus. Those were overpainted at some time between 1903-1918. There is further mystery in that the version shown as the vignette in 1895 predates the date now given for the completion of the original version of this work, 1899. It is therefore even less clear what visitors to the first exhibition of Munch’s Frieze of Life would have seen. 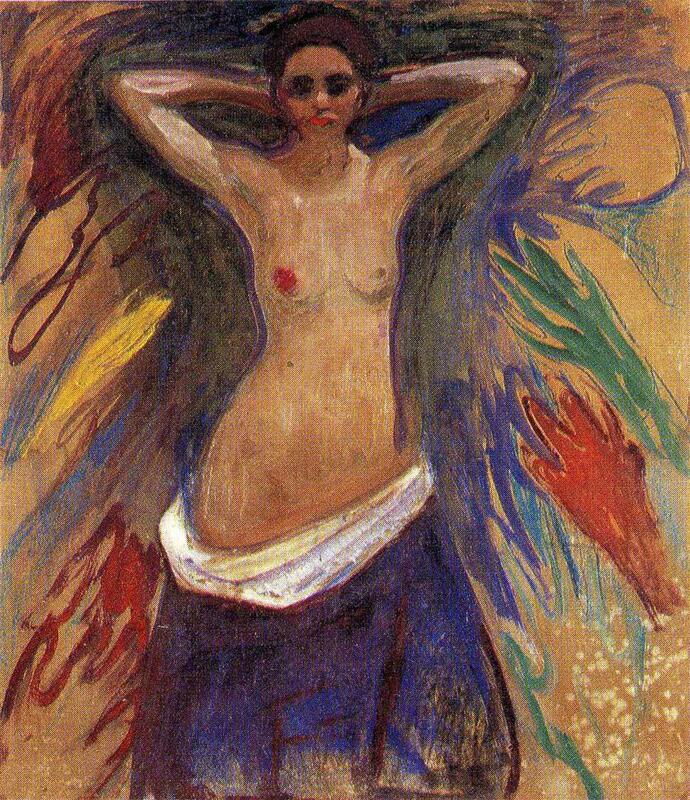 Posted in General, Life, Painting and tagged Munch, narrative, Norway, painting, Salome, series. Bookmark the permalink.